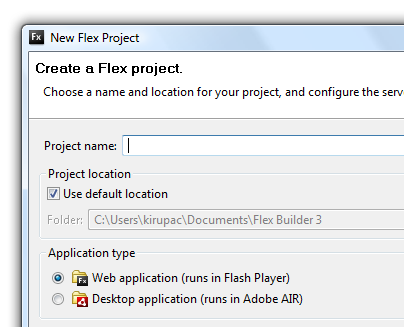 So let�s get you started by building your very first Flex Application. Assuming you�re not a newly born human or have recently crawled out from under a rock and have decided that learning Flex is the first thing that your heart desires, I�ll spare you the basic tour of the Flex interface. 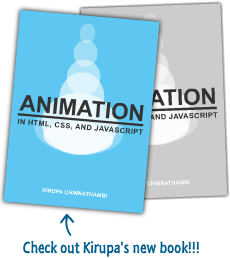 Now, the simple difference should be obvious; a Flex Project can house all of the current projects assets � ActionScript, Images, .SWF Files, and even other Flex Applications. The Flex Application is kind of like the index.html inside of a website root folder. It is the base of your application and is what everything else if build around. I hope that makes sense. First of all, you need to give the project a name, which we decided is going to be �HelloWorld� (without the quotes, of course). Now, I�m going to assume that you have a naming convention that you have learned and tend to stick with, and if you feel confident in your abilities, by all means, have at it. For the sake of consistency on my end, I always name a project capitalizing each word in the name, no spaces or special characters � you�ll notice that even if you try to use an unorthodox naming convention, it won�t let you. Secondly, you are able to decide where your Flex project(s) will live. I use the default folder structure on my Mac, and in most cases, is automatically stored in your systems default �Documents� folder. The �Application type� specifies whether or not you would like you Flex Application to run on the Web, or run as an Adobe AIR (desktop) application. For now, let�s just stick with �Web application� since it suites our needs at this time. Lastly, you can choose to associate a Server technology such as ASP.NET, ColdFusion J2EE, PHP, or some Other server language. We�re not going to associate this little test project with any special languages, so just ignore that for now. I STRONGLY SUGGEST that you take the time to click that tiny little question mark at the bottom left of the dialog box and learn the more about your options when creating a new Flex Project. Don�t be shy, just do it� you�ll love it! Click �Finish� and we�re off. To add functionality to the application, let�s make sure we�re in the �Design� Mode. Once we�ve set up all of the visual components on the stage, we�ll make our way to the �Source� Mode so we can edit the code. Those buttons are located towards the top of the main stage of your application. Once in Design Mode, to the lower left-hand corner there will be a Components Panel that houses all of the available Flex Components. Take a look through the available components and feel free to experiment with them once you�ve completed this basic tutorial. Let�s select a �Label� component and drag it to the stage. Go ahead and place it anywhere, but as you do, you�ll notice that Flex will automatically give you guide lines when you�re either close to a corner, or right smack-dap in the middle of the Stage. This is extremely useful when you�re trying to align your components within the Design Mode. The �ID� field is the components identification, or for you Flash users, it�s like the Instance Name that you can give to any component with that available property. The �Text� field, in this case, is the visual text property that the Label component displays. Let�s set that to �Hello World!� Lastly, the �Enabled� option let�s you decide whether or not you would like your Label component to be enabled or disabled. In this specific case, all this really does it visually change the Label to a slightly greyed �disabled� look and feel. Once we preview the application, go ahead and change that property to �True� and you�ll see what I mean. If you have any questions, feel free to post them on the kirupa.com Forums.